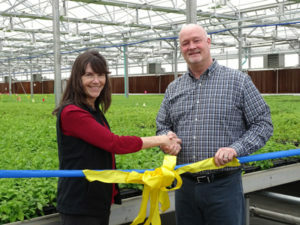 Debbie Thorne and Skagit Horticulture president Scott Crownover cut the ribbon on a new clean-stock greenhouse. Photo courtesy of Skagit Horticulture. Skagit Horticulture (Mabton, Washington) has opened a new, clean-stock greenhouse for large-scale production of select agricultural plant starts launched last year, and appointed an Agricultural Division manager. The new greenhouse will produce virus-free transplants for hop growers, vineyard operators, and orchardists. Initial plant starts for softwood cuttings are sourced from the National Clean Plant Network and will be isolated into the clean-stock greenhouse which is closely monitored for pests and sanitation practices. Skagit Horticulture has also promoted Debbie Thorne to Agriculture Department manager. She will oversee the Specialty Ag division, including sales of hops, wine grapes, berries, and tree fruits. With nearly 30 years of experience, Debbie has held positions in management, production, new product development, marketing and sales for Skagit Horticulture company, which includes her time at Skagit Gardens and Northwest Horticulture.